I’d never understood the whole ‘widgets’ thing that got added to Notes, where you could have additional things in that right-side set of panels. At first, I put Linked In over there, thinking I’d use it to look up people and keep track of discussions. I never did use it and eventually, it would just show me a login box, so when I changed laptops, I didn’t bother putting it back. I tried some RSS feeds, but they were far too chatty for me to ever keep track. However, I found a great use for them this past month: quick access to back-end of XPages databases. That works fine, but you have to navigate back to the home page to get the the link. I could put it everywhere, but as I was looking at the Drag n Drop sidebar per a request from our newly acquired office in the UK, I figured out that creating the XML files and putting them among your widgets was really easy. I know five of the values that you can edit…. contributeTabOnStartup=”false” If you want it to always open as a regular tab when you open Notes, set this to true. Otherwise, set this to false. contributeToSideshelfOnStartup=”true” If you want it to always open as a panel on the right, set this to true. If you’d prefer to double-click and have it open in a new window, set this to false. id=”APPS1SharedEngage” The unique ID for this widget. If you drag-and-drop another XML file with the same ID, it will update the existing one. When you create one using the menus, it supplies a random numeric one, but text also works, so I’d recommend that using meaningful, text ones. title=”ENGAGE SR” This is what displays on the icon in the sidebar and on the panel header if you load it in a panel. Then, drag and drop that XML file from your file system onto the My Widgets panel. In the one I have above, it always opens in a panel on startup, so I can access the views quickly and easily. However, we’re going to have 70 of these at any one time once we roll out our design to all of our projects, so I’ll probably not have any load on startup. If you don’t load them, on startup, double-clicking opens them as a new Notes window. As soon as I finish figuring out how we’re going to configure the Drag n Drop widget, I’ll post on how to do that. While there is documentation on OpenNTF, I think I can provide some more insight and may look at doing some enhancements down the road. One of my co-workers, Neil Enet, asked me the other day if it was possible to set up a view but prohibit the users from opening the documents. I tossed out the idea of using an HTML table with all the HTML for the rows and cells being computed in one column of a view. "<tr><td>" + approverName + "</td><td>" + approvalType +"</td><td>" + description"</td></tr>"
Unfortunately, that’s pretty clunky and not very satisfying. So, as we talked, I said, “Hey, how about you create an XPage with a view and just don’t make any of the columns clickable?” So, he did. My first XPage. I’ve never competed on a race before, but I imagine the feeling of winning one as being pretty similar to seeing this XPage for the first time. And OK, let’s be honest, it’s a pretty simple XPage. “Simple” might be too much of a word, actually. It’s just a view. ONE view. The process was extremely easy. I just dragged the View Control, linked it to the view in Notes that I wanted, and voilà. I changed the font size and color of each column, and that felt like an even more awesome achievement. The funny thing is I’m sure that if I never had the need to create a view like this, where users weren’t able to open documents, this wouldn’t have been so fulfilling. I can see myself saying: “Great, I just created a view, and you can’t open any docs. What’s the big deal about THAT?” But it turns out that that’s exactly what I needed. So simple! And to think that Old Notes didn’t allow me to do this, and that I had to go down the “terrifying” XPages way. Ha! I can’t think of a better way to start playing with XPages. I now know I can do one, and I know I’m being very naive if I say “XPages is a piece of cake”, but there it is on my system, and I’m sure it will not be the only one. Then, to get users to access it from their Old Notes, using an Outline Entry to open the URL…. So, if you’re still in fear of XPages, you needn’t be. Go forth and be LOST IN XPAGES with the rest of us! As we prepare our pilot of our XPage application, I was reminded that sometimes users might find a way to open a document in the Notes client when we don’t really want them to. While the odds are against them getting to a view or to a Notes document, no system is idiot-proof (idiots are absolutely genius sometimes!) So, I dug out an old script that I’d written back during my time at FAA to prevent users from accidentally opening a Notes database when they should be opening it only via the browser. So, the users in question need to be able to update the documents, but I want them to do it in XPiNC or in the browser. That means, I can’t go using readernames fields to hide the documents from them and I know that hiding views (either via not including them in an outline or by naming convention) isn’t necessarily going to prevent them from opening my views. Basically, all we do is check for their roles and if they have the right one, we let them in. Otherwise, they get warned off. I could add some script to this to open the document in the proper XPage, but this is a bare-bones version to help you get started if you have this kind of need. Messagebox "You are not authorized to access " & formName(0) & " documents via the Notes Client! ",48, "Access Error"
While I was at it, I also wrote another version to be used to keep users out if they accidentally opened it on the backup or development servers. (Yes, I know production databases don’t belong on development servers, but it has happened here and, I am sure, other places). Messagebox "You are attempting to open this document on " & serverName.Common & Chr$(10) & "Trying to open the document on MAIN",48, "Wrong Server"
Messagebox "Could not open the MAIN/COMPANY replica of the database, trying local replica",48, "Failed"
Messagebox "Opened the database, but could not open the document",48, "Failed"
Messagebox "Could not open the local replica of the database either",48, "Failed"
These QueryOpens could be placed on individual forms or on subforms that are on those forms. You could put a version in the PostOpen event of the database script, though you have to keep in mind that the PostOpen doesn’t run if the user opens a document via a document link instead of opening a view or the database itself. Come to think of it, I will be putting a version in the PostOpen to prevent unauthorized users from opening the database, but have it quietly open the XPiNC page I want them to open. I thought about putting this in my Security category, but it’s not really about security. It’s mostly about making sure the user gets the proper experience, by using production replicas or the correct client. Hope you found something interesting here! Another of the challenges in my assessment XPage problem is that the evaluators will need to open the attachments that were submitted with each grant request. There are two issues here – first, that the attachments are uploaded to multiple separate documents from the grant request and, second, that there might be multiple attachments on each of those documents. We chose to have the attachments on separate documents to reduce the size of the request document and lower the likelihood of truncation or replication issues. The users requesting these grants are all located in Africa and may well be in remote locations. So, bandwidth issues, even for the browser side, are of paramount concern for us. We’ve had some issues in the past on the Notes side with some truncations or with replication issues and found it better to keep documents smaller as a precaution. So, for each request, there can be up to 4 documents with an unknown number of attachments associated with each request. As such, I stumbled upon the idea of using a repeat-within-a-repeat to display the links for each attachment. Then, I needed to build my repeat control. The code itself is actually very brief. My AnnexLinks view is very simple, with only three columns: AppUniqueID (my index, which is not the document unique ID, by the way), the AttachmentType and the URLs for the attachments. Since there can be multiple values in the URLs column for a single document, I have the link embedded inside a repeat control, using that value as an array to populate my link. I’m computing the filename back from the URL to use as the link label, but using the AttachmentType for the document in the outer repeat to display a label for the attachments. It’s shocking to me that something that ends up so small can accomplish what seemed like a huge tasks initially. On my notepad, I’ve got all kinds of SSJS written to get a handle to the attachment documents, then to try building an array of URLs, synchronized with a list of filenames to be used as labels. Fortunately, by poking around for URL info (h/t to Stephan Wissel – this will have to be updated for XPiNC and upgradeability) and referring back to my copy of Mastering XPages, I was able to sort out how to do it in just a few lines of simple, elegant code. In our continuing example of purchase orders, we move from our examination of dynamic field binding in repeats to the filter used on the source view to select the competition questions we want to appear in that repeat control. Depending on the type of competition, the source selection method and the dollar amount of the purchase order, there are different questions that the person preparing the purchase order needs to answer about the competition. 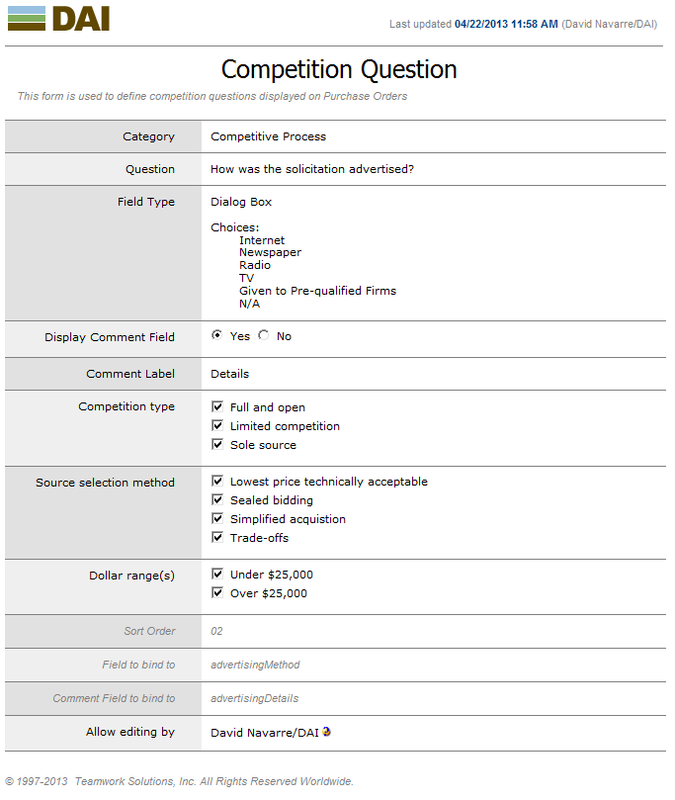 There are several categories of competition questions, but the layout for the questions and answers remains the same, so I created a custom control that is used by all categories and the custom control appears on the XPage multiple times. Each time, I pass the category as one of the properties of the custom control, as well as the criteria (type, method and amount). My view is set up with four sorted columns to filter my competition questions, so with the help of Per Henrik Lausten on StackOverflow, I learned that all I have to do is create an array to be used as the key, just as I would in LotusScript for a GetAllDocumentsByKey. When referring to the custom properties of a custom control within that control, you use compositeData followed by the property name. It makes it rather easy to pass parameters to the control. *Updated to us vArray.add instead of vArray.addElement on Jesse Gallagher’s advice. Thanks, Jesse! In our purchase order module, we need to ask certain questions depending on the source selection method, competition type and total cost of the PO. These questions are likely to change over time and in between different instances of the database. So I have a view containing the questions, so that I can add questions dynamically to my XPage without needing to change the code. To be honest, doing this in a regular Notes form would have required either putting every question on the form or putting a bunch of fields on the form for all the answer fields. Either method would be sloppy and wasteful. There could have been dozens of unnecessary answer fields hidden by hide-whens and constant revisions between various instances of the database leading to a configuration management/version control nightmare. Doing it in a repeat control, with the source view filtered by values passed in an array, I can get dynamically selected questions with only the necessary fields being stored on the document. In order to do this, I had to use all of my minimal XPages knowledge, ask several questions on Stack Overflow, re-read portions of Mastering Xpages and scour the help documentation. You, however, can simply follow my guidance and have this solution for your own. I created a relatively simple Notes form, based on the ones supplied to us for keywords by Teamwork Solutions. The layout is clean and very readable, plus re-using it allows more consistency within our application. A number of the fields are used to determine when and where the question will display (Category, Competition type, Source selection method and Dollar ranges). The checkbox values are derived from keyword documents, to allow maximum flexibility. I’m allowing five field types for answers: Yes/No, Dialog Box, Text Box, Date and Date Range. I had tried Rich Text, but was having problems with losing the handle to the document when saving, and since it wasn’t really required in this implementation, dropped that for later review. Sometimes, the question has a related question to extract more details, so I allowed two questions to be placed on one question document to ensure they display together. Down at the bottom, I’ve got the fields to which the answer fields will be bound on the Notes document. One hazard to allowing the field to be named in this configuration document is that there might be duplicate use of a field name, by the risk level strikes me as low. The way that I started to understand repeats was actually when I set up jQuery mobile access to some data after viewing Richard Sharpe’s webinar for TLCC on Building Your First Mobile Application Using XPages I was able to take the knowledge I acquired doing that and use it to link from one Requisition to many Purchase Orders as demonstrated on this blog. The repeat itself is not that interesting, but, one of the technical tricks in the setup is. As I’ve started to learn XPages, I’ve gotten comfortable with variables stored in applicationScope (available to everyone), sessionScope (available throughout the current user’s session) and viewScope (available on the current page), but had no idea when one would ever use requestScope variables. It turns out that they can be very useful to us here, though we’re going to access them using a dataContext rather than labelling them as requestScope variables. Since I want to take a value from each Question document to determine the field to bind to on the Purchase Order document, the syntax and re-use will be far easier if I can establish a variable for that field name used within each row of the repeat. This way, we can use Expression Language to refer to the field on the Purchase Order document, binding to it dynamically. First, we want to display our question, with the layout handled by a table. We just grab the column value and display it. Since my Question document also allows for the addition of a comment question after the non-TextBox answers, I have another line on the XPage to display those (Note that the dataContext for the commentFieldName requestScope variable has to be added to that panel inside the repeat control as well). In my next blog post, we’ll look at how we filtered the view data source in order to only display the questions we want on a particular purchase order. If you don’t already look at XPages questions on Stack Overflow, you really ought to, and if you haven’t been keeping up with TLCC’s webinars, check out the series. Recently, one of our internal clients asked if we could change who could see a button on one view that is in many of our databases. That sounds pretty easy, right? All you have to do is change the template and those changes will be pushed by the Designer task into every database. Well, unfortunately, while almost all of the 65 databases in question contain the same view, some of those views don’t link back to any template. I’d learned a while ago that the old Notes.Net forum was no longer particularly active and that the community had decided to move questions to Stack Overflow. To digress for a moment, Stack Overflow is part of the Stack Exchange “network of communities” and it’s a great place to both seek and provide answers with experts and budding experts. It was founded in 2010 by one of my favorites in the industry, Joel Spolsky, and Jeff Atwood. Joel’s blog, Joel on Software, provided me with a lot of insights into programming, running a business, dealing with people and, oddly enough, with the first news I had of trouble on the morning of 9/11. So, if you have a Notes, XPages or other problem, go there and ask. I asked around on Stack Overflow (link) and got a recommendation on how to deal with it. Actually, I got a couple of ideas to choose from and Panu Haaramo’s idea was the best. Basically, get a handle to the view by it’s UNID and copy it to the destination database using XPages. I put a combobox (fileChoices) on the page to allow the user to select which database to push to, hardcoding in the view name, but it could easily be generalized and looped. Any thoughts on how to improve the code (especially the null-checking, which I cannot tell whether it does any good or if the try-catch ends up doing everything) will be greatly appreciated, with credit provided and the code updated. Somehow, when I posted this internally, it won “Most Popular Newsfeed of the Month” at our office in January. When I tell you I work for an international development company, that seems to make sense… until I point out that the development the rest of the company does is the other kind of development. That is projects designed to help people in developing countries. So, rather than show how well-received my post was internally, it shows that we’re still early on in our efforts at Social Business.